The Pancakebot - The World's First Pancake Printer! 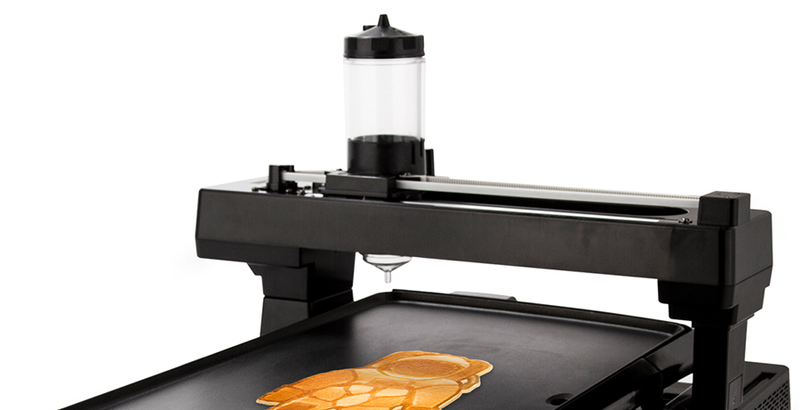 The Pancakebot – The World’s First Pancake Printer! There is nothing like waking up in the morning and smelling the sweet, sweet smell of breakfast. There is something so enticing, especially if what’s cooking in the kitchen is pancakes. Everyone loves pancakes and anyone that doesn’t, well, you shouldn’t trust them. However, everyone also knows that pancakes require a lot of work – you have to get the ingredients ready, you have to pull out 15 pots and pans to mix the ingredients, and then you have to fry them. On top of all that, you have to clean everything up, so you really only get to enjoy pancakes on special occasions. However, a Norway-based dad and pancake lover (and perhaps saver of mankind), named Miguel Valenzuela, has developed an ingenious device that not only makes making pancakes easier and more convenient – it also makes it more fun. Back in 2014, Valenzuela was sick and tired of all the trouble involved in making pancakes for his daughters, so he put his genius mind to work and built what is essentially a 3D printer that automates the entire pancake making process. Not only does the PancakeBot make pancakes simply and instantly, you can also fry griddlecakes into almost any shape and size. The Eiffel Tower, sure! A dinosaur, sure! The system even comes with software that you plug into your computer that allows you to create various designs that can then be transferred over to an SD card. Once the SD card is popped in, all you have to do is fire up the Bot and it starts frying up some delicious pancakes. Another great thing about the PancakeBot is that it is really easy to disassemble and clean. The bot cooks the pancakes on a safe non-stick pan that can be popped out and cleaned. And because you aren’t dealing with batter splashing all over the place, you won’t need to worry about your kitchen looking like a pancake murder scene. Sure, it may seem a little strange to let a 3D printer make your breakfast for you, but once you get the hang of things, you may start to wonder how you lived life without the PancakeBot. In the end, the pancake, which has its roots in Africa, Ancient Greece, China, India, Korea, Nepal, Vietnam, Mexico and beyond, is really the universal language of breakfast. It’s gone through many changes and its evolution has seen the breakfast treat take on many shapes and forms – all of them, or most of them, very unhealthy. But now there’s a breakfast bot, everything may be different. Sure, the breakfast bot may be a few hundred dollars, but think about how fun and easy making breakfast will be!